Announcing my new product… drum roll please….. DroneCell! What is it? Its a cell phone for your robotics/electronics/minicomputer/anything project. 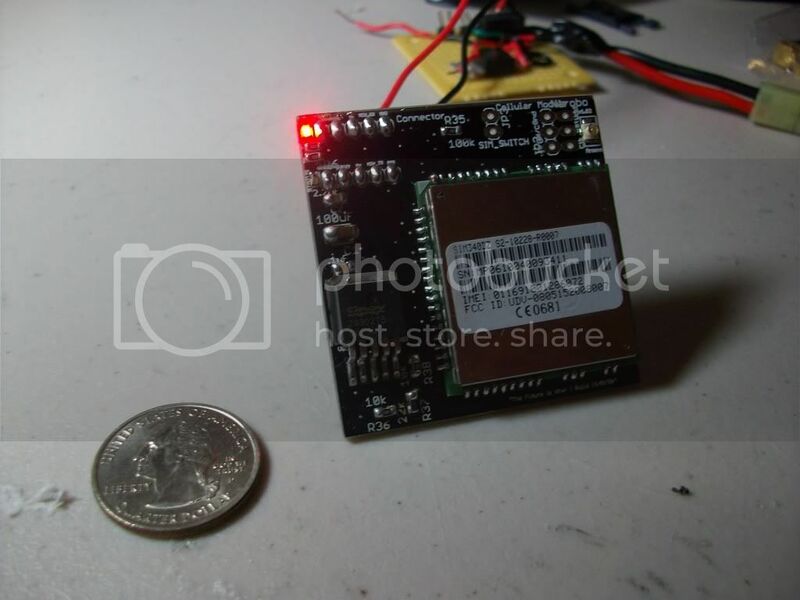 It has a simple 3.3V to 5V UART interface, so it can be easily connected to any 3.3V or 5V device, like most AVRs, PICs. All the necessary voltage level shifting is done onboard, so there isn’t any headache. Connect it to your Arduino, your STAMP, your Gumstix board, your Axon, your whatever. It is completely breadboard compatible, so its perfect for any prototyping rig. Plus it comes with two neat little LED indication lights, so you can visually see and understand whats happening. No more stupid Xbees that have limited range, use DroneCell for nearly unlimited range! It will work anywhere you have a cell tower. Control your robot in Los Angeles from your laptop in New York City. Imagine sending a text message to your custom circuit which starts your car. Or sending data wirelessly over the Internet to your UAV that flying over Afghanistan. Or getting GPS and weather data from your high altitude air balloon. Or even having your butler robot( like my own Chives, look on Narobo.com for details) dial your cell phone and email you when he detects an intruder. All this is possible with DroneCell! I actually used a slightly different version of the DroneCell in a major commercial product, so I have tons of code available. All the hard work is done, so enjoy it in your different projects! Videos and software to be uploaded this weekend and next week. I’ll post up the new info as its available. Currently, I am sending out samples to several retail stores and very few personal friends. Expect DroneCell in a robotics store near you in about 2 weeks. If you absolute MUST have a DroneCell, email me and we can work something out. set waypoints, camera commands, etc. Security systems – cars, boards, sheds, etc. Custom socket server/client – Perl, Python, C#, etc. Hi..can you direct me to where I can purchase a Drone Cell…themakerspace.com carried them but are sold out.